The Ornate or Mottled Bagrid, Chrysichthys ornatus, belongs to the family Claroteidae from Africa; specifically the great Congo River. This catfish is documented as being from the Congo River system below Stanley Falls. It is also documented that this catfish can be found in Cameroon and the Congo Democratic Republic. C. ornatus is a species that I have had the pleasure to keep. This is not a catfish which is commonly available although it is worth looking out for and is ideal for a medium to large sized aquarium. This catfish has evil written across its face, but is one which is full of character. The one I kept for many years would often try to eat pieces of trout, which were far too large for it to eat and resulted in this particular fish trying to ram the food into its mouth by crashing into the end of the aquarium! This catfish was, until around 1991, documented as belonging to the family Bagridae, following a revision of this family the majority of the so-called African Bagrids now belong to the family Claroteidae. In terms of keeping this fish in an aquarium, I would suggest a minimum size of 36” x 18” X 18” for two or three of these catfish, with plenty of hiding places amongst bogwood and plants. The ideal aquarium substrate to use with these catfish is aquarium sand such as BD Aquarium Sand. As with all other species of fish, water quality and general husbandry is very important, and I would recommend that a minimum of 25% water is changed on a weekly basis. 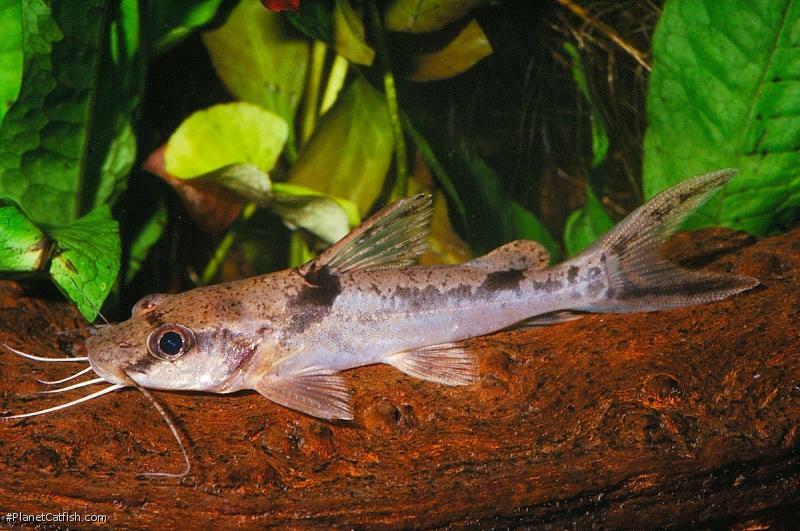 This catfish has often been confused with Goeldiella eques, a South American catfish belonging to the family Pimelodidae despite being from two different continents, they are remarkably similar. The South American species lacks a pair of nasal barbels, has a longer adipose fin and noticeable different head and dorsal fin shape when compared to Chrysichthys ornatus. Thanks to Chris Ralph for this month's featured species article.